Finding a place to set down a real bet online used to be a struggle. Nowadays it seems it's more about an overload of options than anything else. Since blackjack has a variable house edge that depends more on the player, we cannot differentiate the best places to play by their odds or payback percentages (as would be appropriate for locating good slots online for instance). What we're left with is a smaller range of variables upon which to judge our options. These include issues of: security, reliability, consistency and speed in payout, game-play, casino support and user presentation (how pretty they make it). Based on these criterion a few online casino's stand out of the sea of examples. Ironically, one of the major determinants of a casino's quality is its staying power or age, meaning that the good places to bet online these days are often the only places you could find to bet online a few years ago. This list represents a number of high quality casinos that are known across the board for good security, game-play, customer service, no-problem payouts and great looks. Go Casino - Featuring a multitude of games and great bonus offers. Online Vegas - As its name implies; you can't get much closer to Vegas without actually being in Vegas. Getting started in blackjack requires not only an understanding of the method of play, but also an understanding of how this method is put into action at the blackjack tables. To do this it would be nice if you knew what one looked like, and what each area of the table are used for. As you can see, blackjack tables are set up in a half circle shape, where the dealer stands in the middle of the flat edge. Around the arc of the table there are seats and betting areas (sometimes a circle, sometimes a symbol, etc. ), e.g. at the Bellagio in Las Vegas you will find a large scripted B on the area where you are to place your bet) accommodating anywhere from five to seven players on average. To the left of the dealer sits the shoe, from which freshly shuffled cards are drawn. A number rules specific to the table are written on the table felt, which is how you can find out the dealer rules for hitting or standing, how well blackjack pays, and what the rate for insurance is. As any of these rules can change from table to table, always take a look before you sit. The next thing to look for when or before you sit down is the table minimum: the least you can bet on a single hand. As you will find out from reading this site (especially if you have blackjack system dreams) it's just as important to take note of the table maximum. To learn how to play and not look like an idiot, check out our blackjack table manner guide. 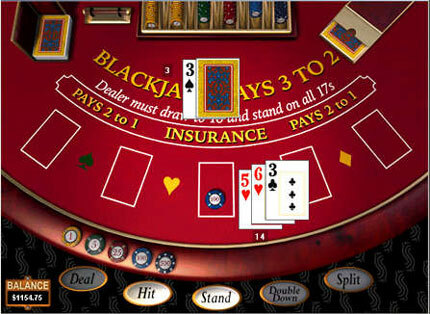 Below you will find a stretch of blackjack tables describing the decision-making rules for basic strategy. To read these blackjack tables properly first take note of the title, which discriminates between tables for hard totals and soft totals. The top row, which reads from 2 to Ace represents what the dealers up-card is. The left-most column represents your own hand. A hard sixteen means your hand isn't carrying an ace (e.g. 10, 6) whereas a soft sixteen would mean you have an ace in your hand that could change value (e.g. Ace, 5). So if you do have a hard sixteen according to the table below (locate 16 near the bottom of the 'drawing rules for hard totals' table), then scan over to the right until you hit the column that corresponds to the dealers up-card. As you can see, you always stand on a hard sixteen unless the dealer has a 7 or 8, in which case you hit, or if the dealer has a 9, 10, or an Ace, in which case you surrender (a rule that does not exist at all casinos, in which you are allowed to retain half of your bet. This is statistically a smarter bet than hitting a hard sixteen against a 9, 10, or Ace dealer up-card simply because you stand a very poor chance of beating them). If surrender is not available at the table you're playing at, Hit where it recommends to surrender. Table B. Drawing rules for soft totals. Table C. Drawing rules for pairs. Table D. Drawing rule descriptions. Hit - take a card. Stand - do not take a card. Surrender if available otherwise HIT. Double if available otherwise HIT. Double if available otherwise STAND. Split if double after split is available otherwise HIT. The tables assume the following rules. Always hit a hard total of 7 or less. Always stand on a hard total of 17 or more. Always stand on a soft total of 19 or more.